If you ask me what the best art, architecture, design movement is, I would say it is the Art Deco movement. I just love the combination of clean flowing lines mixed with hard geometric shapes. Gerber must also like the Art Deco style, because they have incorporated it into their Gerber FIT multi-knife. 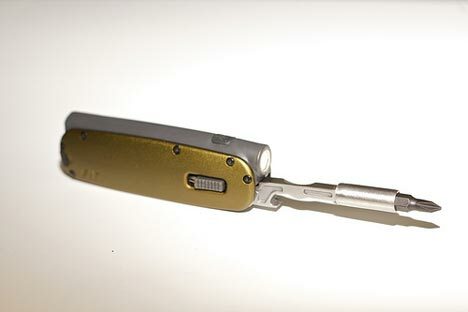 The Gerber FIT mimics the classic look of an art deco locomotive with its front facing head light and aerodynamic body, but in the case of the knife, it uses a bright 25-lumen LED powered by a AAA battery. The knife is pretty minimal in features and is likely meant as an everyday carry. It does have a total of 10 tools on board, but as with all pocket knives they count every little thing as a tool. For example, the photo above shows at least 5 tools: a bottle opener, the LED light, a two ended screw driver (two tools), and a hex nut driver. Also listed is a two-edged blade, tweezers, and scissors. The knife isn't set to be released until February of 2011, so you have a few months to save up for the $50 price tag.